Buddhism has been around since the 5th century, this religion encompasses a variety of traditions, beliefs, and spiritual practices based on the teaching attributes of the Buddha. The Longquan Monastery located on the hilltop in the hinterlands of northwest Beijing has become a haven for a distinct brand of Buddhism. It has evolved and instead of practicing seclusion, they preach connectivity. 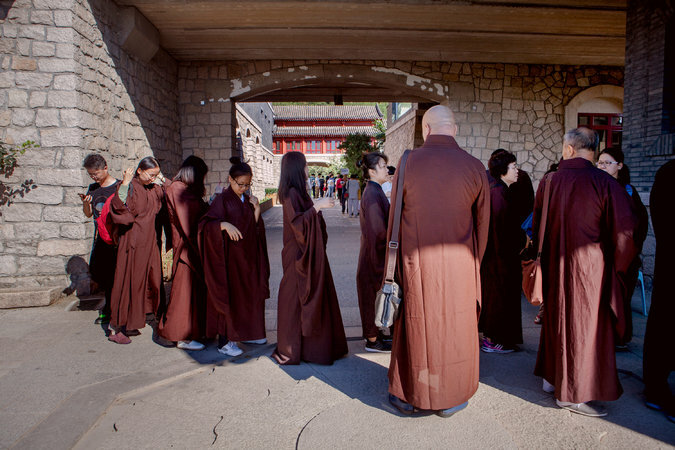 The temple is run by some of the most educated monks in the world. Some of them are nuclear physicists, math prodigies and computer programmers who preferred dedicating their lives to exploring the ambiguities of the spirituality. They have developed digital tools like robots and cartoons that are based on Buddhist ideas like suffering and reincarnation to gain more followers. The leader of the monastery Xuecheng, shares his wisdom to online followers every day, he claims that Buddhism can stay relevant by embracing modern tools. He states that there is no use in people attending daily lectures in a computer-dominated world. Because Buddhism is an old, traditional and also modern religion, it should implement modern methods to spread the wisdom of Buddhism. The temple itself was first built in 957 AD but because of wars and cultural revolution it was rebuilt in 2005 and now has fingerprint scanners and webcams for iPads. People who go to the temple do not necessarily believe in the religion but seek a deeper meaning in a society filled with materialism or simply tips on relaxation. Young entrepreneurs go to Longquan in hopes of creative epiphanies, some of them work for some of China’s biggest tech companies. It is interesting to think how technology is now part of our everyday life, even religion. After hundreds of years of it being very traditional, this new generation has come to recreate the concept and the reach.